Like many books with multiple authors, it's a mixed blessing. I would also like to suggest to Syngress that they hire an editor. This book would have benefited from a stricter hand. It would at least merit a simple grammar check. Please. Is anyone else tired of the word "Hack" or "Hacking" in the title? I wonder if it doesn't take away from the message of the book, when the points are obscured with the obvious memetic charge that such a title gives. For the curious: Open Systems Interconnection Basic Reference Model is described in http://en.wikipedia.org/wiki/OSI_model OSI (the intended replacement for TCP/IP) never caught on, even though, for a time, the government was mandating its use. The seven layer model was still recognized as a useful descriptor of networking, and has come to be used as an abstraction, useful for teaching concepts about networking. This book is arranged in that manner, with the addition of one of the "non-standard" layers as the final chapter. Layers 8, 9, and sometimes 10 have multiple references, such as political, financial, and metaphysical. In this case, the authors have chosen to refer to layer 8 as the people layer. Interesting premise, using the OSI 7-layer model to discuss security, with the addition of the engineer's favorite eighth layer, the user. Point and counterpoint in each chapter of "Attack" and then "Defend" brings some cohesion to this inadequately edited book. This book is tolerable as a beginner's book, but some of the information is old, and it's very uneven. I'm also not sure what the point of it should be. It has some good bits, mixed in there. There's some good information on how networks work, which is explained in understandable terms and language. 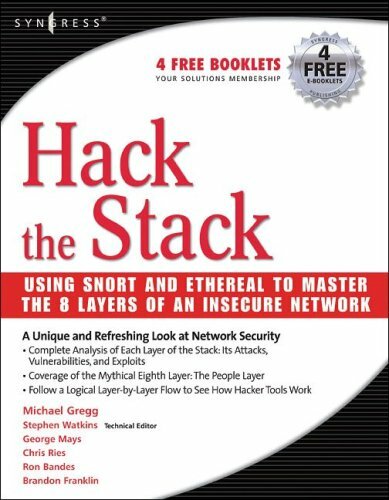 I don't know that this book contributes to the body of work that should comprise a good computer and network security library. The first chapter is an introduction, explaining the approach of the book. The second, termed the physical layer, is actually defined to include everything from locks, lights, and guards (i.e. physical security) to hardware hacking. [Do we really need a discussion of chain link fence sizes in a security book?] I'm not sure of the rationale for things included in this chapter. We have everything from an explanation of pin tumblers (but not what locks are secure) to an overview of passwords..